ThinOPTICS, the pioneering eyewear company that revolutionized reading glasses with its stemless lenses, is launching its second Curated Collection with ArtLifting, this time selected by Quincy Jones. The new line of six ThinOPTICS cases are all designed by artists living with homelessness or disabilities. Funds raised from the net sales of Quincy Jones’ exclusive collection benefit three organizations: ArtLifting, the Quincy Jones Foundation and Keep Memory Alive. You can shop the collection here. The Quincy Jones Curated Collection will launch on April 27th, 2017 at the star-studded Power of Love® Gala in Las Vegas, benefiting Keep Memory Alive, featuring performances by Gwen Stefani and Jon Bon Jovi. Every guest attending the gala will be gifted one of the six ThinOPTICS selections in this exclusive line, which in turn will drive awareness to ArtLifting, the Quincy Jones Foundation and Keep Memory Alive, with the potential of increasing funds from additional purchases. The three artists bring a different and inspirational background story, expression and aesthetic to each of the cases on which their designs are now showcased. The Quincy Jones ThinOPTICS Curated Collection features two pieces of artwork from three ArtLifting artists Charles Blackwell, Douglas Pendleton, and Billy Megargel. “Quincy Jones is the quintessential icon of what is possible. So when we heard that he had chosen two of Billy's paintings to be part of the exclusive collection eyewear for ThinOPTICS, we were deeply honored and thrilled,” says Billy’s mother, Eve Megargel. "Partnering with ThinOPTICS to make The Quincy Jones Curated Collection has absolutely made my soul smile!” says Quincy Jones. The collection features six beautiful designs created by 3 talented ArtLifting artists, and a portion of the sales will benefit not only my own personal foundation, but two other amazing causes: Keep Memory Alive and ArtLifting." Each ThinOPTICS case can be proudly displayed on the back of mobile phones and tablets or tucked conveniently inside wallets, purses and pockets because of its ingenious glasses design that makes them as thin as two credit cards and lighter than a nickel. “Beyond designing eyewear that enhances the lives of our customers, ThinOPTICS is a brand that is committed to making a difference. We are so glad to be able to benefit these three impactful philanthropic institutions that fully align with ThinOPTICS’ mission to serve the greater good,” says Darren Lancaster, ThinOPTICS Co-founder and VP of Marketing. ThinOPTICS entered the market in 2014 and was launched by a passionate team who believes that reading glasses users should be able to access their glasses at any given time. After 200 prototypes and countless trials, the ThinOPTICS team created the “stick anywhere, go everywhere” reading glasses that are as thin as two credit cards, weigh less than a nickel and easily attach to phones or can be slipped into a wallet, purse or pockets. The reading glasses can be purchased in three strengths: Low Range (+1.50D), Mid Range (+2.00D) and High Range (+2.50D). ThinOPTICS has shipped over 1.5 million glasses to over 170 countries to date and currently offers cases for Apple and Samsung phones, as well as in a Universal Pod and Keychain case. They can be purchased on the company’s website and Amazon, but are also available in Walmart Optical, Target and Safeway stores, as well as over 1,000 Independent Specialty Retailers across the U.S. ThinOPTICS was named “Best in Class – Iconic Design” by Inc., “Best of CES 2015” by PCWorld and has been featured on CBS News Sunday Morning, Yahoo! Tech, FOX News, Real Simple, Refinery29 and more. Learn more: thinoptics.com. Named by Time Magazine as one of the most influential jazz musicians of the 20th century, Quincy Jones is an impresario in the broadest and most creative sense of the word. His career has encompassed the roles of composer, record producer, artist, film producer, arranger, conductor, instrumentalist, TV producer, record company executive, television station owner, magazine founder, multimedia entrepreneur, and humanitarian. Among the multitude of awards that he has received for his contributions are an Emmy Award, seven Academy Award nominations, the Academy of Motion Picture Arts and Sciences’ Jean Hersholt Humanitarian Award, 27 Grammy Awards, and is the all-time most nominated Grammy artist with a total of 79 nominations. A recipient of the Republic of France’s Commandeur de Legion d’Honneur, in 2001, Jones was named a Kennedy Center Honoree, for his contributions to the cultural fabric of the United States of America. He was recognized by the National Endowment for the Arts as a Jazz Master - the nation’s highest jazz honor, and in 2010 was bestowed the National Medal of Arts, our nation’s highest artistic honor. In 2016, Jones received a Tony Award for Best Revival of a Musical for the Broadway production of The Color Purple. The award completed the rare EGOT set for Jones, an exclusive club of artists who have received an Emmy, Grammy, Oscar and Tony Award. Keep Memory Alive, whose mission is to provide enhanced treatment and ultimately cures for patients and their families suffering from neurocognitive disorders, raises awareness and funds in support of the Cleveland Clinic Lou Ruvo Center for Brain Health. By supporting Keep Memory Alive and its fight against neurodegenerative diseases such as Alzheimer’s, Huntington’s, Parkinson’s, frontotemporal dementia, multiple sclerosis and multiple system atrophy, we can ensure progress towards better treatments and ultimately cures will occur in Las Vegas. For additional information call (702) 263-9797 or visit keepmemoryalive.org. 2016 was a year of tremendous growth for ArtLifting. After securing $1.3 million in seed funding in July of 2015 from investors like Blake Mycoskie, founder of TOMS Shoes, and Eric Ries, author of Lean Startup, our team has worked tirelessly to reach several milestones. This past year alone, we onboarded more than 60 artists nationwide and now proudly represent 112 artists impacted by homelessness or disability in 19 states. We’re thrilled to support individuals whose perseverance and creativity inspire us every day. From Los Angeles-based artist Eric Santamaria who paints with the wheels of his wheelchair to war veterans who use art to heal, we’re excited to share their stories and life’s work with you. Thanks to our rapidly growing customer base, we paid out a total commission in the six figures to artists. We’ve come a long way since our co-founders, Liz and Spencer Powers, bootstrapped $4,000 of their savings three years ago. Deval Patrick, Managing Director at Bain Capital and former governor of Massachusetts, met with Boston-based artists Allen Chamberland and Scott Benner after purchasing their artworks for his office. The key to our growth has been a resonance of our mission and business model in the corporate art market. More and more companies realize the importance of making socially conscious decisions and how these decisions affect company culture, including the art they put on their walls. It shows employees and clients that they are committed to giving back to their communities and fostering productive and positive work environments. What used to be a logistical process of decorating an office has become an opportunity to visibly showcase a company’s social values. Today, with five licensing deals and over 70 corporate clients later, we feel confident that we can continue to grow our impact by connecting talented artists with companies that want to make a difference. We’re proud to count companies like Starbucks, Google, Microsoft, and Staples as partners in driving our mission forward. In October 2016, we partnered with Google to open the first Art@Google exhibition featuring works by artist Scott Benner. Our website now has a fresh new look to encourage businesses and individual customers to join our mission. Our curation and customer service teams are committed to bringing you the highest quality art and merchandise from some of the most talented artists in the country. Thank you for being a part of this movement. We can’t wait to continue growing our impact in 2017! ArtLifting is thrilled to announce a partnership with ThinOPTICS, the pioneering eyewear company that revolutionized reading glasses with its stemless lenses, to launch a Curated Collection of ten new cases designed by artists living with homelessness or disabilities. The partnership launched December 12th, 2016, and ArtLifting will receive 20% of the net profit from each case sold to benefit the artists directly. Each artist brings a different and inspirational background story, expression and aesthetic to the cases on which their designs are now showcased. Tim Strouss was left partially paralyzed on his left side after surgery complications and took up painting as a cathartic way to challenge himself; Alicia Sterling Beach aims to spread joy and keep herself active by creating art despite degenerative chronic osteoporosis and PTSD she developed in early childhood, which led to stints of homelessness throughout her life. In the face of adversity, each artist found solace and a form of sustainable income in showcasing their works via ArtLifting, and their designs now appear on ThinOPTICS sleek glasses cases – with Strouss’ also appearing on a matching pair of ThinOPTICS readers. In addition to Strouss and Beach, Randy Nicholson, Aneliya Kostova, David McCauley, Jeff Roysdon, Andrew Weatherly, Krishaun Williams and Mia Brown round out the list of artists whose designs are featured on ThinOPTICS Universal Pods, and each of their incredible stories can be found at www.thinoptics.com/artlifting. ThinOPTICS cases can be proudly displayed on the back of mobile phones and tablets or tucked conveniently inside wallets, purses and pockets because of their ingenious glasses design that makes them as thin as two credit cards and lighter than a nickel. The result of two years of innovation and over 200 prototypes, ThinOPTICS glasses have no stems, yet they rest securely and comfortably on the bridge of the nose using flex-grip technology. The lineup of classic colors that ThinOPTICS users have loved since the brand hit the market in 2014 are now further enhanced by the artwork of each incredible artist. The ultra-thin Universal Pod cases and matching glasses featuring “A Balanced Patriotism” by Tim Strouss and “Bipolar Inspiration” by Randy Nicholson retail for $29.95, and the subsequent eight designed cases that come with classic color ThinOPTICS lenses retail for $24.95. These designs and all ThinOPTICS glasses can be purchased at www.thinoptics.com/artlifting with the exclusive and limited collection launching just in time for the Holidays. Nearly 70,000 tourists flocked to The Miami Convention Center last week for Art Basel--an international art fair with annual shows in Basel, Switzerland; Miami Beach, Florida; and Hong Kong, China. Art Basel showcases contemporary artworks by established and newly emerging artists from across the globe. UBS, the title sponsor of Art Basel in Miami Beach, has a long history of supporting the communities in which it works. To honor the Miami community and its unique art culture, this year's UBS Planet Art Lounge featured ArtLifting's own David McCauley. David is a mixed media artist. His work blends design, sculpture, typography, and repurposed materials. His urban contemporary artwork is held in prestigious private collections worldwide and has been featured internationally in solo and group exhibitions with such institutions as SCOPE Art Show, Galerie Lano (Paris), Cheryl Hazan Gallery (NYC), Projective Space (NYC), and The Richmond Art Museum. In 2008, David sustained a spinal cord injury at the C6 vertebrae that impaired his hand usage and paralyzed him from the chest down. To cope with the challenges that came with such paralysis, David turned to creating art. David is also the founder of The Rise Up Gallery and The Little Haiti Laundromat Art Space. Both 501c3 non profit organizations have been awarded numerous accolades for their programs which provide art therapy workshops to the community and studio/exhibition space for artists. As part of its sponsorship this year, UBS hosted the UBS Planet Art Lounge in the public-access area of the fair. ArtLifting artist David McCauley’s work was showcased through a wall vinyl and take-away coffee cups. ArtLifting is helping artists gain exposure, yes, but beyond that we are trying to show that art can be a driver of social change, that talented artists deserve a chance to have a career making art, and that everyone can contribute to society. We were thrilled to have a presence at Art Basel Miami, not as a traditional booth, but as a point of conversation in the Planet Art Lounge. We hoped this presence would open up a dialogue on the potential that art has to transform lives and communities. On October 13th, ArtLifting and Google came together to celebrate the launch of a new art exhibition on Google’s Cambridge campus. Titled Lines In Motion, the exhibition features a curated selection of nine artworks created by Boston-based artist Scott Benner. On stage with Brian Cusack, Industry Director at Google, ArtLifting Artist Scott Benner answers questions about his creations. The exhibition guide encouraged visitors to view the works "up close in order to fully appreciate their labyrinth-like design." Benner proudly presents his work. Google plans to feature two other local ArtLifting artists on its Cambridge campus in the upcoming year as part of a new partnership between ArtLifting and Google called “art@Google” and hopes to create similar exhibitions on its campuses across the country. Every year on November 11th, America honors the nation’s veterans on Veterans Day. There are 21.8 million veterans in the US, roughly 7% of the population, according to the 2014 Census Bureau. Sadly, often times the horrors of war follow the veterans home. More than 20% of troops who served in Iraq or Afghanistan have come home with PTSD, and 12% of America’s homeless are veterans. Art, for these veterans, is a place of refuge. By Clyde R. Horn, PhD. I'm proud that I answered the call to my country. Sacrifice and honor is a big deal to veterans. I'm proud to wear my veteran hat, Purple Heart insignia, and stand tall. Freedom is the backbone of America, and I'm part of the proud tradition of helping America stay free. I was in the 199th Light Infantry Brigade. We flew in helicopters all over Vietnam, and we were dropped off for several weeks at a time into the jungles. Then, we returned to the Saigon area for several days for showers, hot food, and entertainment. Then it was back to the jungles fighting the enemy. When I returned from Vietnam in 1968, it was hard times. Being in war changed my life, having come close to death many times, being wounded, and seeing death all around me. I was traumatized. I wasn't able to reveal I was a veteran for fear of being attacked. Thankfully, today that fear is no longer present. It makes me proud, and I often have tears leaking out of my eyes when people approach me with kindness and respect. Veterans Day honors the sacrifice of those who lived and died throughout the generations for this country. When I came back from war, I had problems attaching along with relational issues. I became a loner, isolated, and struggled with a sleep disorder and high levels of anxiety. I was a functional mess. Art helped me channel those struggles into something productive. Art, for me, helps me go to safe places. Anxiety and trauma take away safety. It's disruptive and chaotic. Art is soothing, quiet, and relaxing. My photography is mostly nature based, so I feel grounded and in tune with the hum of the earth. Being calm to the forces of trauma helps me heal. Art literally helped me survive PTSD (Post Traumatic Stress Disorder) by helping me refocus. I used my art to express emotions without words and utilized my creativity to find healing. I am new to ArtLifting, but am honored to be part of an organization that elevates the homeless and disabled as productive human beings. To me, it exemplifies the oneness of humanity revealing we all have gifts that need to be seen and shared. For ArtLifting’s artists, the opportunity to present commissioned artwork at the MFA is nothing short of a dream come true and an astounding opportunity. When two like minded companies come together, dreams come true, and that's just what happened on Wednesday, April 26 in Soho, NYC. Kimberly Williams discovered her lifelong passion for creating art when she was three years old. A native of Ft. Washington, Maryland, Kim started battling mental health concerns and addiction early in her life, causing her to be in and out of homelessness. Kim paints to harness focus and maintain a positive outlook on life. Day 10 of 12 Days of Giving means not one artist feature, but two! Today we’re featuring Randy Nicholson & Judi Dahlquist. Both are abstract-expressionist artists living with bipolar disorder. David Foye is an incredibly talented local artist whose art reveals both an adventurous spirit and a positive outlook on life. David is a South Boston native and makes art to convey his visions of how life should be in the future. Happy 4th Day of Giving! Today’s featured artists are Nick Morse, Grace Goad and Billy Megargel. For every purchase of their artwork and/or products, ArtLifting will donate one art-related toy to a child in need! Giving, not receiving, brings true holiday joy. For the 12 days of giving you have the opportunity to give back to both an artist and a child in need! 55% of every sale goes directly to the artist! David Trujillo was born and raised in Santa Fe, New Mexico. The landscape and fabric of New Mexico life has greatly affected his art, a craft he has been involved with for most of his life. David first got into art in highschool and has lately reconnected with his talents through a community art program at the Santa Fe Club House. The Santa Fe Club House offers outpatient treatment programs, community, and work opportunities for adults with mental illness. ArtLifting is celebrating this week! Not just Halloween, but also all the recent attention our artists have received from major news outlets. This week TechCrunch, Forbes, Boston Globe, Boston Business Journal, and Bostinno.com featured stories about ArtLifting’s recent big changes. In case you missed it, ArtLifting announced this week that we raised 1.1 million dollars of funding to further grow the company and reach out to empower even more amazing artists. With the new funding we also launched a new website design with increased options for products. Spring 2015 ArtWeek kicked off yesterday in Boston with a bang! ArtLifting is thrilled to have participated in the opening ceremonies, where lights were turned on at the top of the Pru, and to now be featured on the ArtWeek Boston homepage! ArtLifting is excited to announce that we will be hosting an exhibit in partnership with Lexicon Gallery in Gloucester, MA. The opening reception will take place on May 8th from 6-8pm. ArtLifting CEO, Liz Powers, and ArtLifting Artist, Scott Benner, will both be speaking at the opening reception. The exhibition will include several works by some of our amazing and inspiring artists surrounded by Lexicon’s array of beautiful ceramics. ArtLifting is so very grateful for the generosity and support from Seyrel Williams and Jenny Rangan of Lexicon Gallery. Since our start in December of 2013, ArtLifting has grown rapidly to become a nationally recognized social enterprise. We have grown from empowering 4 artists in just Boston proper, to 50 artists in 8 cities across the nation. On this lovely independence day weekend we would like to celebrate the independence some of our artists have gained through the sale and celebration of their artwork. Not only have our artists been able to generate an income out of something they love to do, they also have been able to take control over their lives and become more independent. That was a very exciting weekend for ArtLifting as two of our artists, Scott Benner of Boston and Kimberly Williams of Fort Washington, MD were featured on CBS News. The segment aired on approximately 80 local stations across the U.S. throughout the weekend. You can view the full story here. “Art is what I do [as] opposed to taking a drink,” Kimberly says, “art is what I do [as] opposed to getting high.” In December, Kimberly sold a three-piece painting to Creative Office Pavilion, a furniture dealer based in Boston, via ArtLifting. The painting set now hangs in one of their conference rooms in the Boston Design Center for office visitors to admire, learn about, and be inspired by. The confidence and income that Kimberly gained through this sale gave her a tremendous emotional boost and allowed her to buy a Christmas gift for her four-year-old son, an avid painter as well. The Washington Post profiled this story last December. We are excited to announce that on Wednesday, March 11th, ten female ArtLifting artists will be featured in the Boston Museum of Art's very first "Women in the Arts" event. On December 11, 2014 ArtLifting partnered with global fashion brand, REISS, for a special night to celebrate the holiday season. Attendees were treated to a specially cultivated collection of Reiss’ holiday apparell to enjoy with drinks, light bites and wonderful artwork. San Francisco. – October 15, 2014—ArtLifting has expanded its national presence to encompass San Francisco. ArtLifting is collaborating with two San Francisco institutions for this initial launch. Artists participating in the ArtLifting platform were discovered through Hospitality House’s Community Arts Program. Hospitality House has been serving the homeless and low-income community in San Francisco’s Tenderloin neighborhood since 1967. 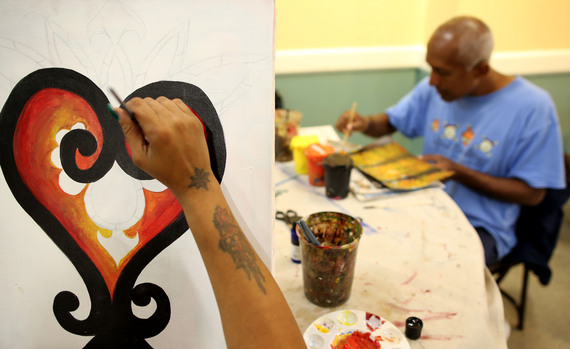 The Community Arts Program is the only free-of-charge fine arts studio for poor, homeless, formerly homeless and at-risk adults in San Francisco.